« *** WINNERS *** Tawnda, Susan and Heather are Living the Life of Riley! CONGRATULATIONS! Jewelry has always been one of my favorite items to shop for. Jewelry doesn't judge and show you the extra pounds you've gained over the holidays, unlike clothing. Wearing jewelry can make you look terrific as well as be an instant conversation starter all at the same time! I've always been drawn to unique jewelry because I love to make a statement. Bottled Up Designs not only creates one-of-a-kind jewelry, they do so from antique glass and bottles reclaimed from bottle dumps! This guarantees that your necklace or pair of earrings will have a serious story to tell and be good for the environment too. 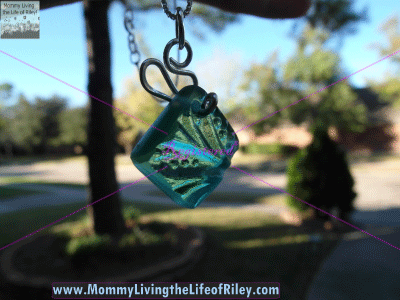 I had the opportunity to review the Teal Sandwich Glass Ribbon Necklace. Keep reading to find out more! 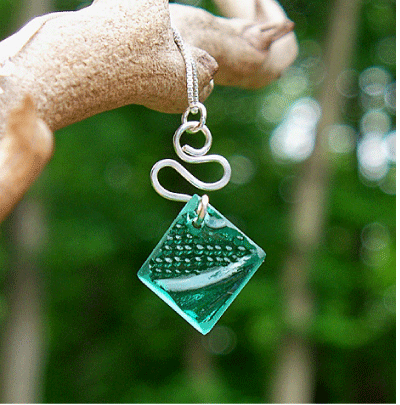 I reviewed the Teal Sandwich Glass Ribbon Necklace from Bottled Up Designs, which retails for $60.00. I immediately fell in love with the beautiful creations from Bottled Up Designs as soon as I saw their website. I couldn't get over how delicate and interesting both their pendants and earrings were. Once I found out that these pieces were all created from antique glass found in bottle dumps, I was amazed! It just goes to show that beauty can be found anywhere if you truly look hard for it! The Teal Sandwich Glass Ribbon Necklace was my personal favorite for I adored the color of the glass as well as the intricate, lacy patterns on it. I was thrilled when this necklace arrived on my doorstep, for I thought my specific necklace was even prettier in person than on the website! This piece of glass is attached to an 18" sterling silver necklace with a sterling silver wire hammered in the shape of a curled ribbon. Attached to the end of the ribbon was a 5/8" piece of antique teal sandwich glass which had a wonderful floral pattern on it. Now, as I mentioned earlier, I love a piece of jewelry that tells a story and is an instant conversation starter and here's where Bottled Up Designs made my job easy. They actually send an informative card with your jewelry which explains the history and approximate age of your particular piece of antique glass. I thought it was so neat to learn that teal sandwich glass was first produced at the Boston & Sandwich Glass Company and that my particular piece of glass came from a 1950's plate. I've committed this story to memory and have retold it several times to anyone who comments on how beautiful my necklace is. Everyone I've shared this with has always found it extremely interesting! If you would like to do your part to help clear a bottle dump of some antique glass AND get an absolutely beautiful and unique piece of jewelry with an interesting story to boot, then head on over to Bottled Up Designs to check out their huge selection of wonderful necklaces and earrings. I can guarantee you that any jewelry lover will be thrilled to find one of these pieces of antique glass jewelry under their Christmas tree this year! 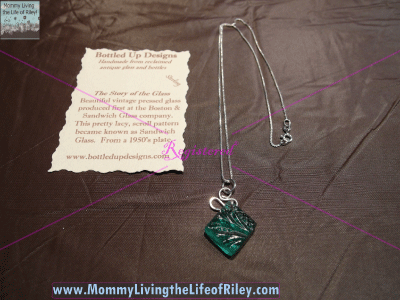 Disclosure: I received the Teal Sandwich Glass Ribbon Necklace from Bottled Up Designs in order to facilitate my review. No other compensation was received. This product review is based on my own personal experiences with this item and is completely honest and objective.